These were the symptoms sophomore Aidan Wiley said he experienced while living in a room he described as having “clear mold colonies” in Johnson Residence Hall. Wiley is among many students who have voiced concerns about the presence of mold and its effect on their health in Johnson, Bostwick and Collins Residence Halls. According to an informal poll of 59 current Johnson residents obtained by the Old Gold & Black, 98.3 percent of respondents said that “they do not normally get sick or get sick easily.” However, more than a majority, 83.1 percent, said that they have been sick since moving into Johnson and 62.7 percent said the sickness was “respiratory-related.” While the symptoms cannot be definitively attributed to the presence of mold, as only 28.2 percent marked “yes” for whether or not they have seen mold in their rooms, it may be considered a potential factor of the respiratory problems reported. “Molds can cause health problems in a couple of ways. Most commonly, perhaps, they cause allergic reactions similar to seasonal allergies. Some species can make specific toxins that can have more serious effects on our health,” said biology professor Jim Curran. Several students who said they considered themselves to be healthy individuals have experienced respiratory symptoms since moving into Johnson and consider the mold to be a cause. Multiple students living in Johnson also voiced their concerns about Student Health’s response to their symptoms. Wiley was also referred to an outside ENT for his health issues after he had visited Student Health four times. “At each visit, a Student Health worker asked which dorm I lived in. On one occasion, after telling them that I lived in Johnson, they responded ‘Well, that could be it’,” Wiley said. According to Student Health Director Cecil Price, they do not receive a disproportionate number of freshman from any one residence hall. Similarly, he said that the number of students seeking help for respiratory issues has not notably increased in recent years. According to Residence Life and Housing Assistant Director of Operations Zach Blackmon, the University has recently been in communication with students living in “Bostwick and Johnson Halls regarding possible mold growth.” Blackmon explained that if students find mold in their rooms, they should fill out a work order with Campus Facilities and Services. From there, the response to the mold is informed by the University’s Mold Management Plan. The Mold Management Plan, created in 2006 and most recently updated in November 2016, details the definition of mold, the responsibilities of different bodies on campus in dealing with it and procedures for treating the presence of mold. Under the section of responsible staff, both a “Mold Assessor” and “Mold Remediator” are listed as the specific personnel trained to deal with mold in campus buildings. The former determines the severity of the mold and the course of action to remove it, while the latter is concerned with executing the removal. In most cases, according to Blackmon, the affected area is cleaned and given a mold inhibitor to prevent recurring growth. However, “complex or sizable” mold growth can be dealt with by an approved third party. The idea of moisture being the key element of mold growth is echoed within the Office of Resident Life and Housing’s “Mold & Mildew Prevention Guide.” Some of the tips include keeping the windows closed, using the heating/cooling unit only between 70 to 74 degrees and removing wet/damp items from one’s room. However Feighan explained that in his experience, taking all of these precautions does not mean that mold will stop being produced. “A lot of my residents, they have air purifiers/dehumidifiers, they close their windows, they don’t have mattress pads and they still have mold. It’s a bigger issue [than moisture],” he said. Wiley, who was given a dehumidifier by Residence Life and Housing after his roommate voiced concerns, said that the mold initially went away but “seemed to grow more” once it began to get warmer in March. 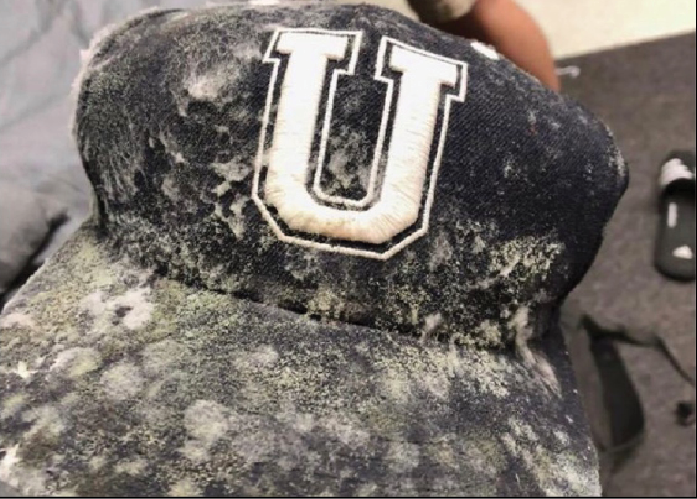 Photos circulating among students living in Johnson include that of a baseball cap covered in mold, a ceiling with mold spores and a window sill that is visibly deteriorating, falling off of the wall. Similarly, another Johnson resident described seeing a cup filled with mold and a chair with growth spots. Students have noted concerns about mold in other residence halls as well, specifically Bostwick and Collins. The Physical Planning Committee, a Student Government subcommittee focused on campus facilities and safety, has received multiple complaints about mold from residents in Bostwick and Collins and is specially aware of its presence in Collins. “We continue to work on [the presence of mold] because it is a systemic issue that cannot simply be addressed by each individual student,” said Physical Planning co-chair and sophomore Jenna Mayer. Blackmon emphasized the fact that the University is “dedicated to providing a healthy campus living experience” for students on campus. However Feighan said that he does not think the University is doing enough to ensure this. Specifically, he said he was met with resistance when he approached Residence Life and Housing with information about mold and its effect on health that he had compiled through a survey from those living in Johnson. “They kept trying to flip it on me and say that it was my fault and that I was not doing my job as an RA correctly and I was the one in the wrong for sending out a survey … when my whole point of having countless meetings with them was to tell them that they are not doing their job of providing healthy living conditions for us,” Feighan said.